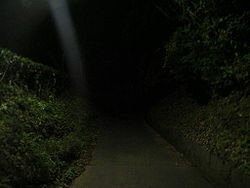 In Tsushima in Nagasaki prefecture, when the rain falls at night, the bakemono known as the Nure Onago appears. 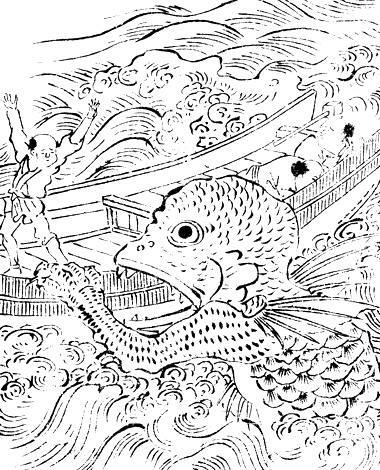 The Nure Onago can appear near any body of water, from a small pond to the ocean. Her entire body is drenched, and she is soaked from the top of her head to the tips of her toes. The Nure Onago can be found in several parts of Japan. 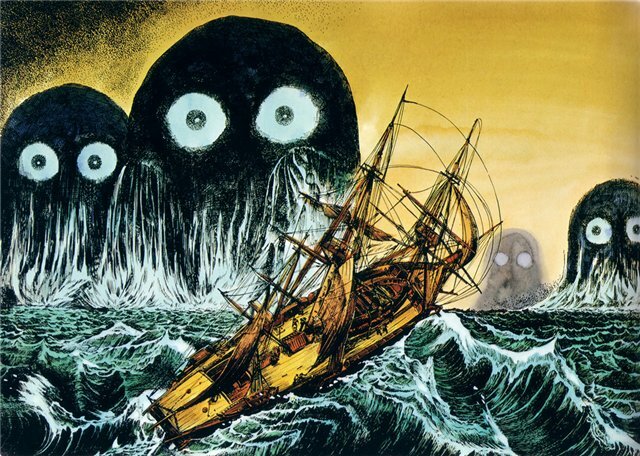 In Nuwa in Ehime prefecture, it is said that you can see her hair stretched out and floating on the surface of the ocean, and it is from there that she appears. 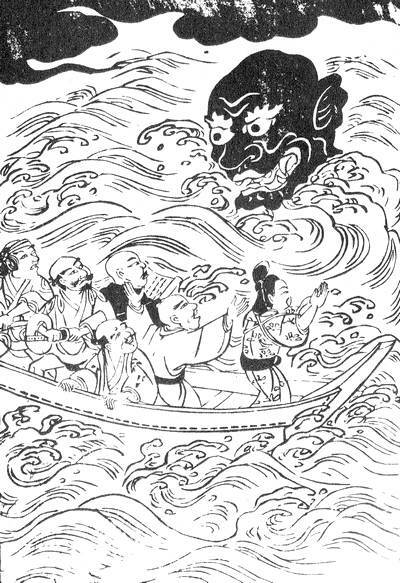 In the Uwa district, the Nure Onago doesn’t come from the ocean, but it is said that she appears from a soaking wet mop of hair. The Nure Onago always has a wicked smile, and laughs hideously. If by chance you hear her and, thinking she is just a regular woman amused at something, should laugh along with her, then she will attack you swiftly and without mercy. 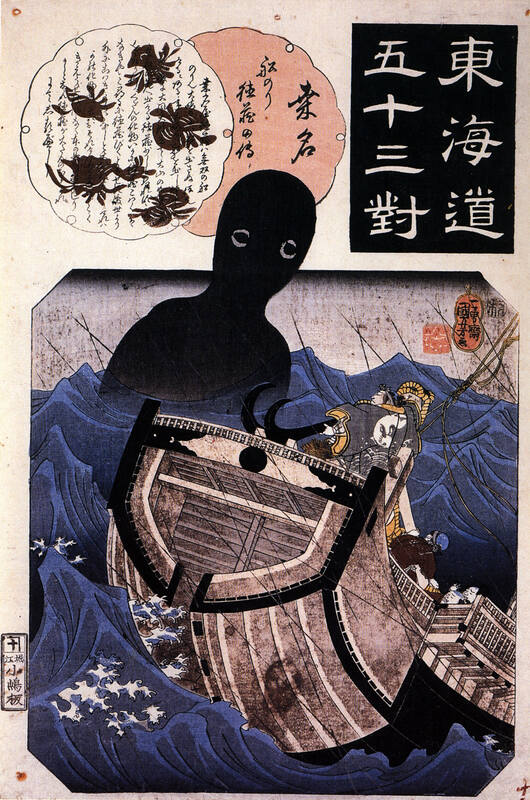 In Kagoshima prefecture, in the cape of Tajiri where the famous festival for the god Ebisu is held, there is a similar yokai. They call her the Iso Onna (Beach Woman), and like the Nure Onago she is soaked head to foot. The Iso Onna appears anywhere there is sand, either on the actual beach or inland if there is sand. The main different between the Nure Onna and the Isa Onna is the lower half of their bodies. The Isa Onna is said to have no lower half, but instead is formed like a snake below the waist. 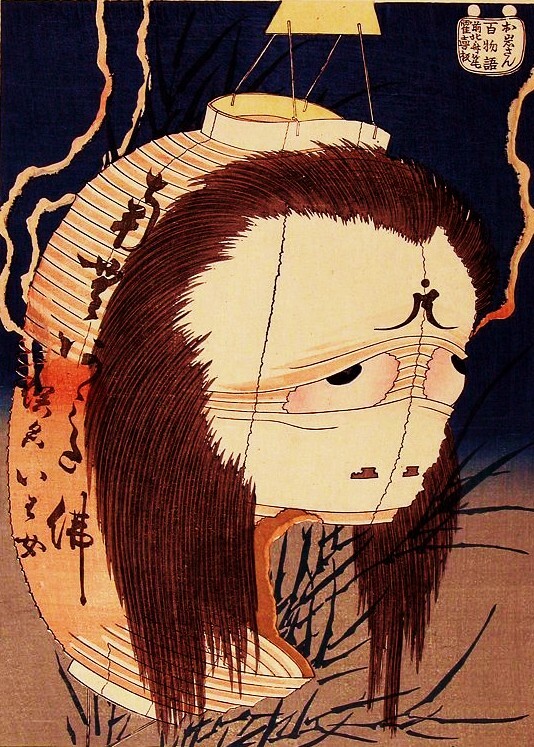 Both the Iso Onna and the Nure Onago are types of the yokai called Nure Onna. Most depictions of the Nure Onago show her as being nothing different than a regular human woman, dripping wet. The Nure Onago is a relative of the Hari Onna (Needle Woman) from western Japan. 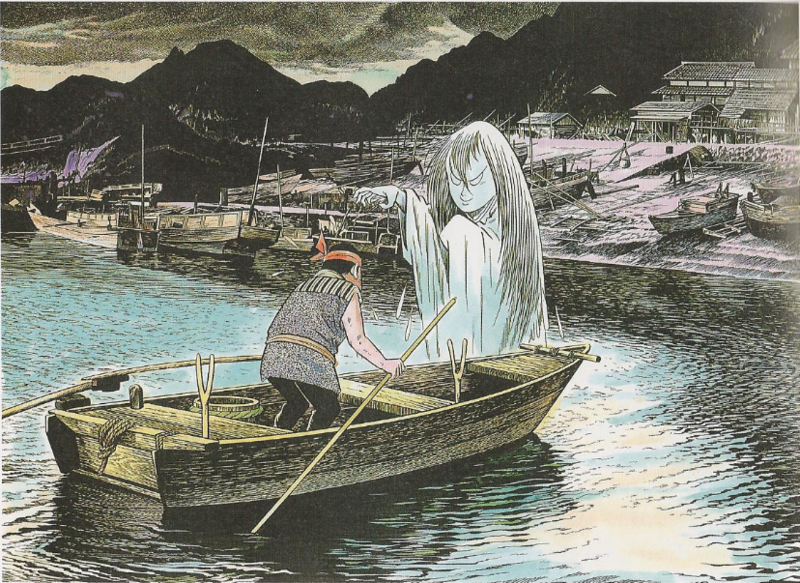 Mizuki Shigeru’s depiction of the Nure Onago is quite different than most portrayals. 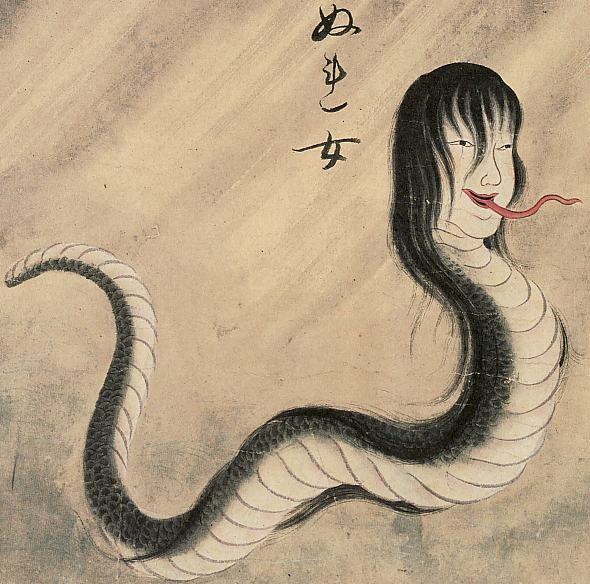 Mizuki’s description is more in tune with the name Nure Onna 濡女子 which means literally “Wet Woman-child” or “Soaked Woman-child.” The related Nure Onna is traditionally drawn as a snake with the head of a woman. She is also sometimes described as carrying a small child (odd considering the lack of arms) which then turns out to be a bundle of leaves. 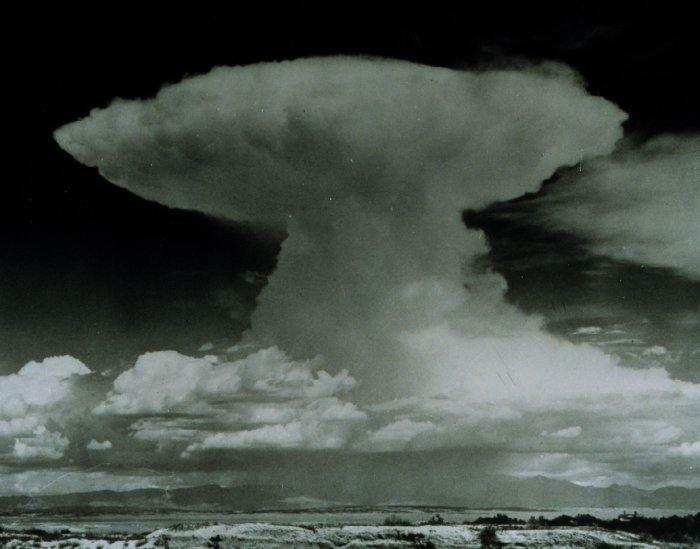 This story is taken directly from the Ubume legends. In July 28th, in the seventh year of Kaei (1854), a sake seller plied his trade between the Kamakura riverbanks and the lower valley. On that day, an old monk of about sixty years of age came to the sake dealer, bearing a small sake bottle that could hold no more than three or four swallows. “Please fill this with three masu (about three cups) of sake” the monk said. Now, there was absolutely no way three masu of sake would fit in the old monk’s bottle. The young sake seller was suspicious of some trick, but he did his job dutifuly and smoothly poured the three masu into the small bottle. Much to his surprise and wonder, the sake bottle held the volume. 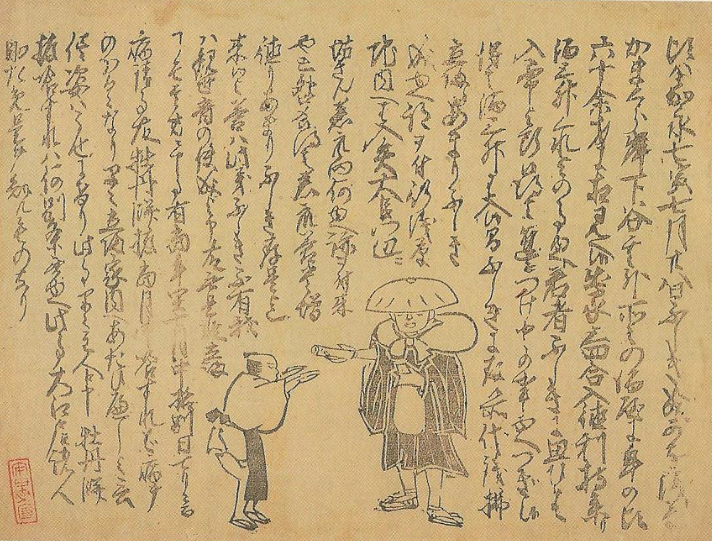 The monk readily paid for three masu of sake, then went on his way. Overcome by the enigma of the sake bottle, the young sake seller silently followed the monk. He followed the monk to a temple in the Jinai area of Asakusa, and crouched by the Yadaijin statue near the front gate. “Why have you followed me here?” the monk said in a reproachful. “Because I have never seen such a mysterious thing in my life as your sake bottle.” the young sake seller answered. 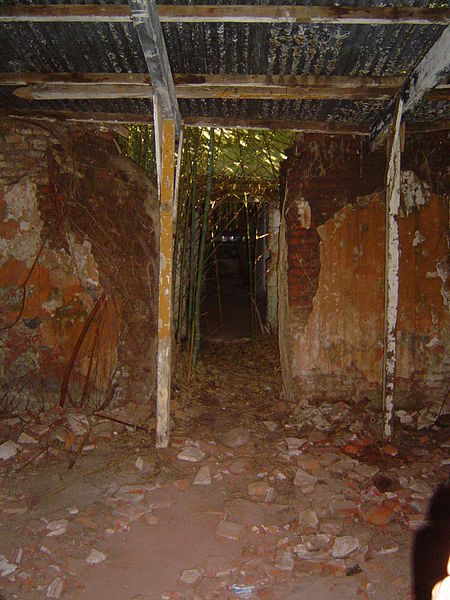 With that said, the monk vanished. The young sake seller ran home as fast as he could and told his master what he had seen and heard. The people of the house did as the monk said and ate the peony cakes, and when the sickness came not one of them fell ill. There is another example of this kind of story. 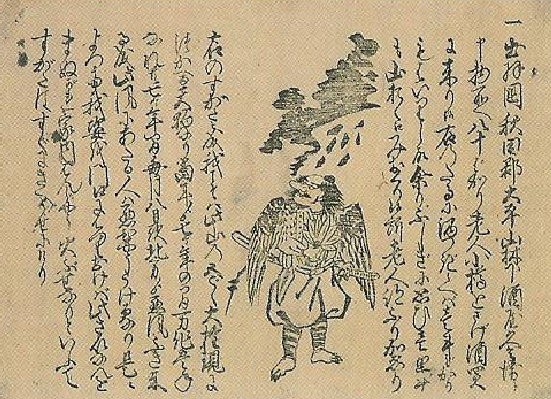 Tales are told of the tengu of Ohira mountain. This is one of them. In Ohiru mountain, in the country of Dewa (Modern day Yamagata prefecture), an old man came into a sake dealers shop. The old man was carrying a sake bottle, but ordered only a single spoonful of sake. To the sake dealer’s surprise, the sake bottle was filled to the brim by that one spoon. He decided to follow the old man, and learn the secret behind his magical bottle. Following him into the mountains, the old man showed his true form as the tengu of the mountain, and prophesied both a rich harvest and a terrible disease for the coming year. If the old man wanted to escape the ravages of disease, then he must take an image of the tengu to a temple and place it before for the gates and pray to it. The old man did as he was told.